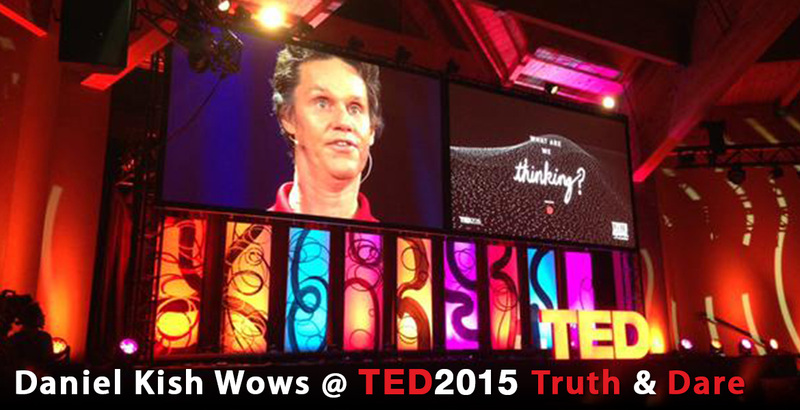 Daniel Kish is listed as one of the top ten talks from the TED2015 main stage. He Delivers a warmly stirring and personal perspective on his own life, blindness, and helping others to navigate their challenges. "Kevin Chesters, the executive planning director at Mcgarrybowen, gives his top ten take outs from TED2015." "It’s an optimists dream. We can conquer blindness AND deafness, we can free the slaves, we can reach and live on Mars, we can redesign the entire global economy to save us all and it turns out laughter really IS the best medicine." "Daniel Kish: Occasionally in life you meet or see someone who reminds you just how amazingly resilient and inventive humans are. This guy went blind at 13 months old and taught himself to "see" by using a series of clicks of his tongue. It earned him the nickname "The Amazing Batman" and he’s now teaching FlashSonar to thousands of others." "I learned that a human can actually develop a skill of echolocation, almost like bats. Daniel Kish, who has been blind since he was 13 months old, learned how to navigate and understand the world by making clicks with his voice. Seeing him in action was absolutely amazing." "4. A living human sonar : Daniel Kish's talk is inspiring in many ways. Daniel is blind, but navigates the world with quick taps and clicks that give him a sonar-like picture of the world around him. He can "see" in 360 degrees and has taught this techniques to thousands of others. The next time you are down about a roadblock in front of you watch this talk again." "How Daniel Kish, who’s been sightless since he was 13 months old, taught himself to see through the blindness—to find vision in the echoes"
Daniel Kish and Brian Bushway illustrate the process of learning to see with sound for Success Magazine. Daniel Kish - How Can You See Without Seeing? A segment from an episode about adaptation, featuring an in depth interview with Daniel Kish in connection with his TED talk. Show-cases Daniel's arrival at the TED2015 conference, how he learns his way around, and his thoughts about his up-coming talk. "Daniel Kish is completely blind and uses a cane to get around, However, he also uses a different method to learn about his surroundings. AMI's Grant Hardy learns more about echolocation." Includes interview with TED's Kate Torgovnick May. "Born deaf, TED Fellow and artist Christine Sun Kim uses sound as her medium, so when she saw Daniel Kish (TED Talk: How I use sonar to navigate the world) explain how he uses the echoes from the clicks of his tongue to navigate the world without sight … she was intrigued. The two of them got together to talk about how they each perceive sound, and to share their thoughts on sight and sound"
"Raised by pragmatic parents, Daniel was taught to enjoy the same freedoms and responsibilities as any other child, understanding early on the difference between love and fear. By not allowing his fears to immobilize him in the face of challenge, his parents encouraged Daniel to face the dark unknown by putting freedom first, because that's what love does." Daniel Kish's talk is featured in these TED2015 highlights. Various TEDx talks given by our staff in various countries about what blind people can teach sighted people.